Paramedics driving their ambulance down a narrow street on an emergency call suddenly realized the dog running in front of them was leading them to their patient who had passed out. 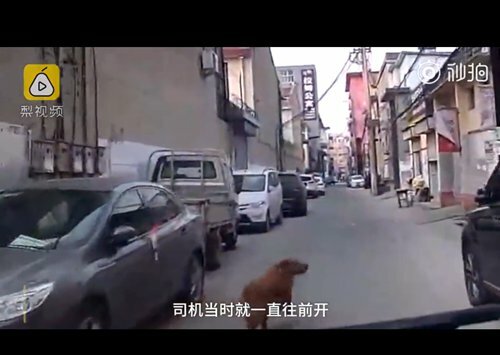 A video from an ambulance dash-cam shows a golden retriever in the middle the street seemingly waiting for the paramedics to arrive. The golden retriever then runs full speed in front of the ambulance never attempting to get out of the way. It finally ducks into a doorway along the hutong or residential alleyway, in Yuncheng, Shanxi Province, Pear video reported on Wednesday. "We got a call saying that a trash collector had fainted at his home and was frothing at the mouth so we were immediately dispatched there," said Jiang Xu, one of the paramedics. It wasn't until they arrived at their destination that they realized the dog was leading them to the patient's home. The man's son returned from Henan Province as soon as he received news of his father's emergency, only to discover that the man was not seriously ill, he was passed-out drunk, said Jiang. "Amazing! How could the dog be so clever that it can recognize the ambulance?" wrote BoxingCindyu on Sina Weibo.